My wife and I with our riding companion took a 13 day trip from home to the Ozarks in Missouri. 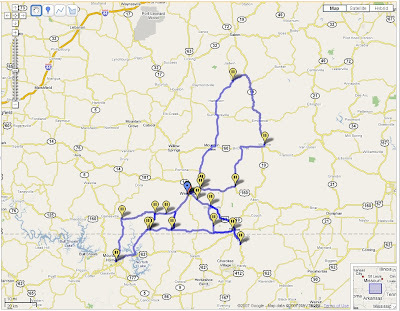 We planned to take 3 days to travel the 1000-miles from home to West Plains, MO maximizing the time spent on secondary roads. We traveled about 300 to 350 miles each day stopping for 15-min each hour. This pace, combined with generally dry weather and moderate temperatures made for a very easy ride there and back. While there, we spent 7 days riding the roads in the Ozarks. A beautiful combination of good weather, winding roads, minimal auto traffic, and a general lack of local constabulary made for a perfect vacation. Here's a map showing the local Oz riding we did for a week. Note, several tracks were ridden numerous times as we stopped to visit family, eat meals, and sight see. Here's a Picasa (Google) Web album of the photos geo-coded to a map. Check it out. I've been asked to provide more details about the posted rides. Ok. I'll do my best to record details about the road, weather, places, people, and anything else of note. Posts on rides already taken will continue to be succinct and are unlikely to include many details beyond the route (using Google Maps) and some photos. For some rides I'll include GPS data (lat, lon) for points of interest. 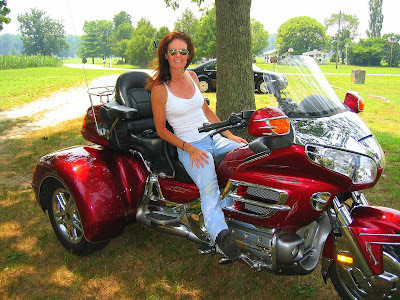 In August 2005, my wife rode her 2001 Goldwing Trike from home to Atlantic City with me as passenger. I forgot to record the mileage, but it was on the order of 500-miles. We combined some Interstate roads with byways; not having too many options when heading north from the Washington DC area and trying to make time due to a late day start. In any case, we had fun staying at the Sands Casino Hotel in Atlantic City and returned via the ferry from Delaware to Maryland. We spent two nights and three days on this trip. Check out the map below. Arriving in Atlantic City at the Sands Casino Hotel. This is one of the water towers south of Atlantic City. Nice. Waiting for the Cape May-Lewes Ferry. What was it like when there were no cell phones? On the Ferry pulling away from Cape May, Delaware. Anywhere, anytime, any how...my wife finds a way to make friends. Here's a couple of wild ones anxious to disembark the Ferry. According to various sources including the National Highway Traffic Safety Administration (NHTSA), the typical motorcyclist rides less than 2000 miles per year--other sources indicate much less. Thus, most motorcyclists don't ride enough to develop good riding skills much less good riding-safety awareness. Up until two years ago, I averaged more than 18,000 miles/year and in the last two my riding is down to 15,000 miles/year--so even using the low figure, I ride about 7 times more than most riders. So, what follows are 9 tips I've picked up that have helped me stay safe even when riding in the non-motorcycle friendly Washington DC metro area. I provide them here in the hopes that some of you may find them useful. If you're thinking of buying a motorcycle, please include these tips with the other safety information you're gathering. 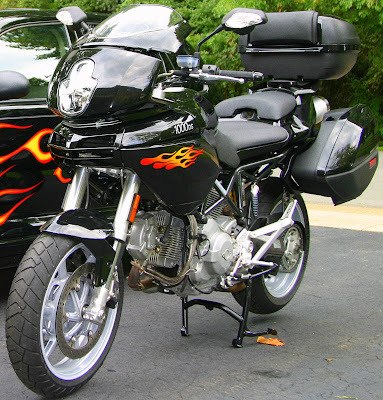 Take the Motorcycle Safety Foundation beginner's skills course. For the price of the course (a good investment IMHO), you get to ride someone else's bike (so don't worry about dropping it!) and learn a good deal about what it takes to ride safely on the street. Despite what you might hear, this is not a motorcycle familiarization class--if you don't know how to ride, don't assume you'll learn from this class. It's best to know riding basics before you take the class. Riding a motorcycle is not hard: if you know how to ride a bicycle, you're more than half ½ way there. Get someone willing to show you the motorcycle mechanics: the clutch, gears, brakes, throttle, etc. Find a large parking lot and practice riding. Riding a motorcycle is just like a lot of other things: 90% attitude & 10% mechanics. My then teenage son learned to first ride a motorcycle after about 10 minutes of instruction on a 625lb Honda American Classic Edition! Note: If you can't pass the MSF beginner's course, you should not ride a motorcycle. Assume every car you can see is trying to run you over. Not that they could run you over, or that they might run you over, but that they're trying to run you over. Never forget that even the smallest car is more than a 1000lbs heavier than the largest motorcycle. The laws of physics do not favor the motorcyclist in any sort of car / motorcycle encounter. Ride with your high-beam on during the day. The intent is to be seen. Riding with your headlight high beam on may irritate some drivers, but at least they see you! Legal disclaimer: Driving with your high beam on may be illegal. I'm not a lawyer. But I'm also not alone in believing this to be a good practice. Say to yourself, "Just ride the bike." Modern motorcycles with good tires can be leaned at heart-stopping angles without falling. If you find yourself in the middle of a sweeping turn going a little too fast for comfort, don't panic. Just ride the bike. In almost every case, you'll make it through fine. Trust me. Your front brake is your friend. You should use both front and rear brakes for every stop. However, many seasoned riders use only the front brake in most non-panic situations. A bike's front brake, just as with cars, provides more than 75% of the braking power. New riders are sometimes reluctant to use the front brake probably because they falsely believe they'll flip over the handlebars. This probably stems from previous experiences on bicycles. To go over the front bars using only the front brake requires a concerted effort. Unlike on a bicycle, the center of mass for a motorcycle and rider is relatively low. Physics is on your side here. If you're not in the habit of using your front brake, you're like to have a close encounter of the unwanted kind. Even small-engined anemic bikes will out accelerate all but the most potent cars. Use this to your advantage. In some cases, it may be easier to avoid a dangerous situation by speeding up and getting out of the way rather than slowing down and hoping the "problem" passes you by. Be conscious of lane position. Imagine a single lane divided into 3 portions: right, center, and left. Avoid the center portion because that's where oil, antifreeze, and other fluids from cars tends to drip and therefore can be slippery--especially when it first starts to rain. Most riders don't do this, but I suggest riding in the portion of the lane (right or left) that's nearest the center of the road way. That is, if your traveling in the left lane of a 2 lane divided highway, ride in the right portion of that lane. If you're in the right lane, ride in the left portion. This positioning keeps you towards the center of the road way and makes you most visible to cars. Further, it provides you the most room in case you need to make an evasive maneuver away from the center. Many riders avoid this lane position because they think they want to stay as far away from cars as possible. This can be dangerous if a driver, who may not see you, tries to merge into the lane with you. Related: I avoid riding in the center lane of a 3 (or more) lane divided highway. Riding in the center lane means you need to watch cars coming from all directions. If you stay in the right or left lane, you reduce the area you have to scan. Never get between a car and an exit ramp. Invariably, the car driver will suddenly remember that the exit you are now passing is the one they want. No doubt you've seen this while driving in your car and it appears the forgetful driver doesn't see the car between him and the exit ramp. This driver will almost certainly not see a motorcycle. Because of this, I tend not ride in the right lane on interstate highways. So, this tip coupled with the previous suggests you should avoid the center of a lane, avoid the center lane (if it exists), and avoid the right lane. That means ride in the left lane. So as not to be too much of an irritant to drivers, keep you speed up! If you're a beginner, don't ride in the rain. With good tires, you can ride almost as fast, lean almost as far, and brake almost as hard in the rain as on dry pavement. If you have rain gear, even getting wet can be minimized to a minor inconvenience. So, what's the big deal with riding in the rain? Visibility--or lack thereof. A driver's ability to see you, and just as important, your ability to see them, can be severely diminished in the rain. As a test, turn your windshield wipers off in your car the next time it's raining and you'll see how hard it is to see. My wife and I have attended each Daytona Bikeweek from 1999 to 2005. (We've skipped the last two for scheduling conflicts.) The day after we arrived at Bikeweek 2005, it rained and was very cool. Generally, this is a poor combination for riding and it keeps most posers in their hotel rooms watching daytime soaps. However, we met up with an intrepid group of Moto Guzzi riders who were undaunted and planned a ride from Lake Monroe Park near Sanford, FL to the Blackwater Inn Restaurant in Astor. Obviously, riding in the rain with the temperature hovering in the upper 50s, is less than ideal. But we're tough! My wife and I are 3rd & 2nd from the left. All of us are suited for a rain ride. Our riding companion for this and many other rides is to my immediate right. This is a Google Earth view of the ride based on my GPS track. I know it's difficult to see, so here's a Google Map showing the route. Despite the rain, it was a nice ride. 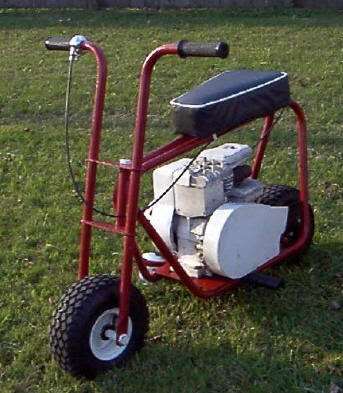 In the mid 60's, my first two wheeled vehicle was a lawn-mower powered minibikes. It had a rigid frame, centrifugal clutch, no gears, and essentially no brakes. I rode it 'til it died. But the imprinting had been done and there was no turning back on 2-wheels. 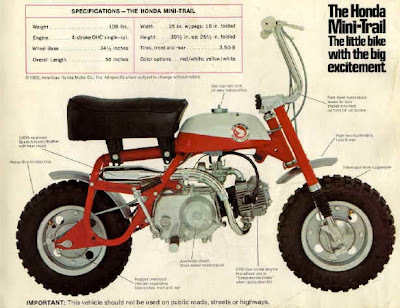 I soon graduated to a Honda 50cc MiniTrail. Again a minibike but with larger tires and a 4 speed transmission. Still a centrifugal clutch that simply required twisting the throttle closed before making a shift--a good learning bed for the mechanics of a proper motorcycle. Alas, this bike had too many close encounters with tall leafy plants with strong trunks. 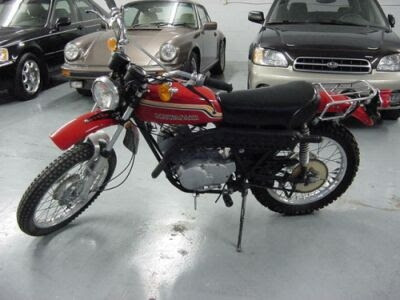 The last of these small bikes was the Honda SR70 Trail. 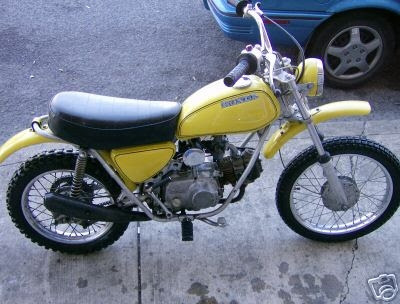 This was the first non "minibike" motorcycle I rode. Like it's smaller brother, it had a 4-speed transmission with centrifugal clutch. I don't remember what happened to this bike. 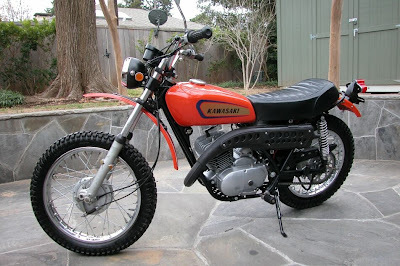 The Kawasaki KE100 100-cc trail bike was the first technically street legal motorcycle I rode. But I was still several years from getting a driver's license and so all of the things that made this bike street legal were removed (lights, etc.). This bike led an exclusive life in the dirt eventually becoming my motocross race bike. I did quite well in the 100-cc class for a couple of seasons. Alas, the motor ultimately blew up on this bike. Being without a motorcycle wouldn't do so I got a Kawasaki F7 175-cc dirt bike. The additional 75-cc engine size made this bike a real screamer in the dirt as compared to the KE. Like the 100, it was denuded of lights and other non-essentials and rode with reckless abandon through the woods and over the hills. After several years, when I finally got my driver's license with motorcycle endorsement, this was the 2nd motorcycle I rode on the street (see below). 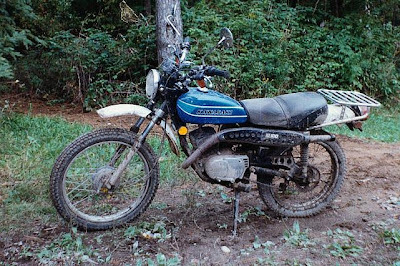 Though technically a trail bike, the Kawasaki F8 250-cc was too heavy for the dirt--at least for a scrawny kid (yes, there was once a time when it was correct to describe me as scrawny). The F8 was my "first car"--my first fully licensed street vehicle. I rode it on nearly any paved street within a 100-mile radius of my house. Being too broke to buy new tires when they wore out, I reassembled my F7 175 (which by that time, had been dismantled and was in boxes) and rode it on the street until its tires also wore out. 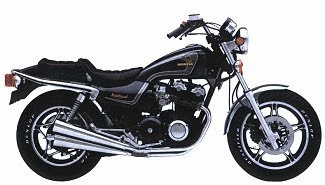 My first real street going motorcycle was a Honda 750 Nighthawk in the early 80s. This bike is among a class of bikes known as the UJM. I took many long rides on this bike. At that time, a "long ride" was defined as a ride sufficiently long that when I dismounted, I could barely walk. This bike was the first of my ride-through-the-winter bikes. Unfortunately, since it was also during my "I know everything" period, I rode without the benefit of winter motorcycle riding gear. It's a wonder I survived. In spring 1985, the morning after a rain, I was leaned over in a turn at speed when I came up on a relatively large water puddle in the middle of the road. Before I knew it, I was sliding across the pavement trying to remember if a car was behind me. I watched my bike slide past me (it had more momentum than me) and have a close encounter with a tree. I was stopped in the ditch on the side of the road and didn't hit anything particularly solid. After some moments, I got up, picked my bike up, and rode on to work with bent handle bars, broken bike bits, and small pebbles ground into my legs and shoulders. I ultimately replaced the broken parts, but life started to impose other pressures not the least of which was a move from southern to northern VA. My Nighthawk stayed home in my parents garage where it stayed for nearly 10-years before being sold. After a 10 year hiatus, I decided in 1996 to get back into motorcycling. I mused of purchasing a Harley and made a good faith effort at several local Harley dealers to give them my money. However, this was the heyday of Harley when they sold everything they made and 18-month waits with $1000 deposits were the norm. This struck me as unAmerican. I went to the Honda dealership and rode off with their American Classic Edition Shadow--an unabashed Harley clone. Alas, the ACE was too much of a Harley clone in that it didn't have much giddy up. The next year, I traded it for the brand new 1997 Honda Valkyrie. 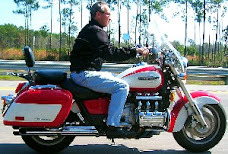 Fitted with Honda's trademark 6-cylinder horizontally opposed engine hopped up to include 6 carburetors, the Valkyrie had all of the giddy up I needed. Maybe a bit too much as I quickly became a collector of speeding tickets with its concomitant collection of increased insurance premiums. This bike is a masterpiece. In March 2004, I turned 100,000 miles returning from that year's Daytona Bikeweek. 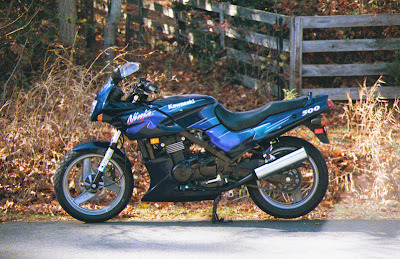 For a short time in 2000, my son & I shared saddle duty on this Kawasaki EX500 Ninja. Though technically a "beginner's bike", this motorcycle is a blast to ride even for seasoned riders. My only complaint was the sport bike riding position was hard on a non-sport bike body...I ultimately sold it. Sigh. A trike is not a motorcycle. But it is no less fun. A trike with the high performance of the Honda 1800-cc Goldwing engine makes for excitement all of its own. 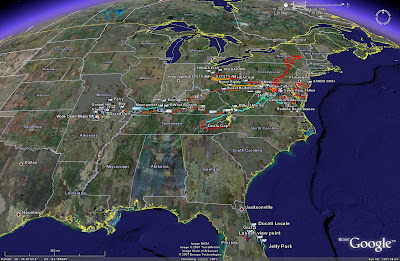 Here's an image of a Google Earth snapshot showing all of the motorcycle ride tracks I've recorded since 2005. It's my intent over the coming posts to single these out and discuss them in some detail. I intend to provide maps and other information of interest. In the meantime, salivate. Reducing the autos...how do we do it? For those of you that don't know, I live in the Washington DC Metro Area. In general, every day is 'Ride Your Motorcycle to Work Day' for me. I ride year around. As long as there's no snow on the road and the temperature is above freezing, I'm riding. (My temperature record was 17-deg. However, on that day my eyeballs started to freeze so I upped my limit by 15-deg. Yes, there's a fine line between showing commitment and needing to be committed.) Rain is a nuisance but not a deterrent. Summer's heat can be as much of an inconvenience as winter's cold--but I remain steadfast on two-wheels. What's been cramping my style lately is the number of automobiles on the road in this area. The WMA traffic woes are not just during morning and evening rush hours on the weekdays. The weekends, particularly in the summer months, are equally horrendous. I'm soliciting ideas for how to get some of these cars off the road. Seriously. My wife and 2 friends decided to take our bikes for a ride on Labor Day 2007. We planned to ride to Yorktown, across to Jamestown, and then back to home. Wanting to get a quick start, we headed to Fredericksburg, VA via I-95. The Interstate is not something we relish, but we were wanting to make time. Getting off at Rte 17 heading south we stopped for breakfast in the old town of Tappahannock at Lowery's Seafood Restaurant. We continued south across the York River Bridge to Redline Motorsports so I could test ride one of the new Ducati Sport Classics (a topic for a subsequent posting). Having got that out of my system, we went north on Rte 17 to the Colonial Parkway heading for Jamestown. The Colonial Parkway is a pleasant, low-stress road for bikes. The scenery is nice and the pace just right. At the end of the Parkway, we took the Jamestown Ferry across the James River to Surry. We continued north to Hopewell where we crossed the James River again heading back towards home. Having traveled 358 miles averaging a speed of about 37-mph, we arrived home nearly 12 hours later. The weather was beautiful all day and we agreed this was one of the better Labor Days we could remember. 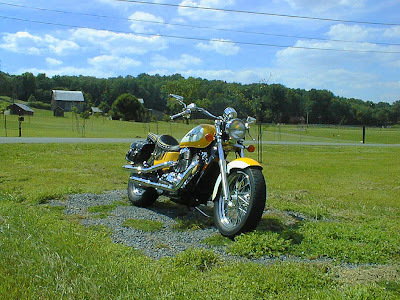 Without contest, Rte 211, aka Lee Highway, is one of the best motorcycle roads in the northern area of Virginia. 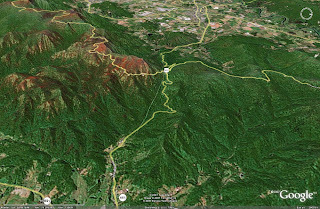 It lays east to west connecting Warrenton with Luray. Crossing over the Blue Ridge Mountains it widens into 3 lanes giving the uphill side an extra lane for the switchbacks--this is superb when slower traffic is between you and motorcycle bliss. If in this area, you owe it to your self to check out this road. This blog will chronicle motorcycle rides I take with my family and friends down the street and beyond. I'll intersperse thoughts and comments from current rides with those I've taken previously. Feel free to comment along the way.